In the case of Steve Crooks and Era Lea Crooks v. The State of Louisiana filed in the Ninth Judicial District Court the presiding judge sided with the plaintiffs' expert testimony in his decision to declare that Catahoula Lake was a flooded river basin and a man-made lake and therefore not a publicly owned waterbody. 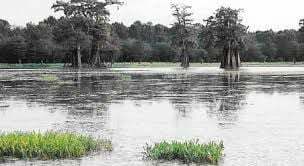 The lower court's decision that declared most of the area of Catahoula Lake privately owned was upheld by the Third Circuit Court of Appeal. The Louisiana Attorney General's office filed a writ application on Jan. 28, seeking the Louisiana Supreme Court's review of the case. The amicus brief filed on behalf of the three organizations asks the Louisiana Supreme Court to consider the important natural resource values of Catahoula Lake that have been consistently managed for the betterment of the ecosystem and in accordance with the Public Trust for decades. The brief describes concerns about what will happen to the management of Catahoula Lake and the public's natural resources if the lower court decision is upheld and Catahoula Lake is declared privately owned. The amicus brief also outlines contradictory or unclear aspects of the lower court decision and the Third Circuit's analysis. Key points made in the brief include inconsistencies from the courts' decisions on how to define the boundaries of public and privately held lands in Catahoula Lake and confusion around the courts' methodology for determining that the body of water was a "river" and not a "lake." The amicus brief asks for the Supreme Court's guidance around conflicts with previous court decisions that affect interpretation of the law. Attorney Beaux Jones with Baldwin Haspel Burke & Mayer, LLC, who filed the amicus brief on the organizations' behalf, noted, "Louisiana Appellate Court decisions such as Crooks are not given an automatic right of appeal to the Louisiana Supreme Court. Instead, parties must request that the high court exercise its authority. Because of this uncertainty of review, the conservation organizations made the bold step to put their advocacy into action and illustrate for the Court that the case before them was more than a simple property dispute. Regardless of legal definition of Catahoula Lake, the end result should be the continued management of the habitat for the benefit of the public and for the sustainability of the natural resources that have flourished there for generations." Catahoula Lake has been called "the most important inland wetland for water birds and shorebirds in Louisiana" by U.S. Fish and Wildlife Service. It serves as a critical piece of the Mississippi Flyway for hundreds of species of migratory birds. Catahoula Lake is recognized as a Ramsar wetland of international importance for its unique example of a lower Mississippi River wetlands providing critical migratory bird and freshwater fisheries habitat. "We appreciate Attorney General Jeff Landry for filing the appeal and we believe the conservationists’ amicus brief introduces valid arguments for the Supreme Court to consider," said Rebecca Triche, LWF Executive Director. "Good natural resource management depends not only on sound management practices but also on cooperation from private and public interests. Are the ownership boundaries made clear in this decision? How will this decision about Catahoula Lake affect the management of the peoples' natural resources as provided for in the Public Trust Doctrine? What does this new definition for a waterbody mean for existing public waterbodies or in the future where Louisiana's coastal zone is a changing landscape? The Federation's membership values hunting and fishing, bird watching, and other outdoor recreational uses and supports wildlife habitat conservation. Those values as they relate to Catahoula Lake and the entire Mississippi Flyway could be affected by this case." John Devney, Delta Waterfowl Senior Vice President had this to say about the appeal. "The amicus brief was not filed to argue for or against the property rights aspect of the decision," said Devney. “That is for other interested parties to argue and the courts to decide. It does raise conservationists' and sportsmen's concerns about the implications for habitat management, sustainable wildlife conservation, and the future of public access." Louisiana Wildlife Federation is a statewide, non-profit conservation, education and advocacy organization dedicated to conserving Louisiana's natural resources and the people's right to enjoy them since 1940. Backcountry Hunters & Anglers is a nonprofit organization that seeks to ensure North America's outdoor heritage of hunting and fishing in a natural setting, through education and work on behalf of wild public lands and waters.